Xpress Art Center and Mark Keppel Elementary have teamed up to make an impact on education. As Mark Keppel Elementary awaits the outcome of their grant submission from the federal government to become a Visual and Performing Arts Magnet school, Xpress Art Center will be there to enrich any artistic venture. If and when Keppel succeeds in receiving the grant the school will officially become Mark Keppel Accelerated Visual and Performing Arts Magnet School, this means the students will have arts instruction integrated into academic instruction everyday that is where Xpress Art Center will step in. We are so delighted to play a role in this transition and be partnered up with a school that understands the power of art and the importance of incorporating it in everyday education. Regardless of the outcome, which we are sure will be favorable, we congratulate Mark Keppel Elementary for their initiative. One of our raffle-off winners, 3rd Grader from Keppel Elementary, Keertana Babu, came by for her free two-hour session at Xpress Art Center and loved it so much she is now apart of Xpress Art Center family. 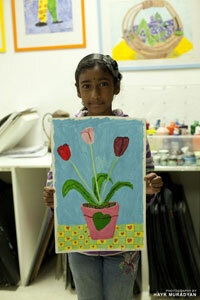 We were so happy to see Keertana and were wowed by the painting she created with the help of her instructor. We are sure she will continue to grow and create more beautiful works of art as a returning student. We want to see all our raffle winners in class!